Situated 300 metres from Benidorm centre and the Levante beach, this hotel makes an excellent base for your beach holiday and benefits from all the amenities of its sister hotel, Poseidon Palace. The Bilbaino Hotel is just situated in the main shopping and tourist area of Benidorm. It is only 10 metres from Levante beach, 50 metres from the historic centre and 150 metres from the port. Situated at the heart of Benidorm, the Carlos V apartments are the perfect accommodation for a family holiday in the sunshine, near the lively entertainment and nightlife of the town. Come and enjoy our fantastic situation in the heart of amazing Benidorm, Playa de Levante. This well-equipped hotel has 3 outdoor pools and 1 heated indoor pool. Servigroup Pueblo Benidorm is just 400 metres from Levante Beach. The hotel has excellent facilities for adults and children. Set just 300 metres from Levante Beach, the Hotel Venus is the perfect place for a sun-filled holiday by the swimming pool, in the popular resort of Benidorm. This hotel is the perfect place for a fun-filled holiday in the sun in Benidorm. It is situated a 2-minute walk from the beach, and set in tranquil surroundings, just outside the city centre. Set beside the bay of Benidorm, this holiday hotel allows you to spend a day on the resortÃ¢â‚¬â„¢s beautiful beaches before returning for a drink in the hotel bar. This family establishment is situated in the centre of Benidorm, only a short distance from the beach, the shopping centre and the nightlife. 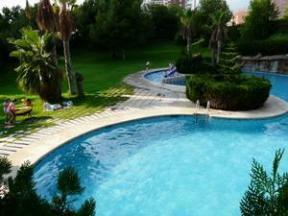 Apartamentos Mirador 2 are only 150 metres from La Cala beach, and have an outdoor swimming pool. They are set just outside Benidorm, with free public parking nearby. The Beni-Beach apartments are set just 50 metres from Poniente beach in Benidorm, and have a lovely, large covered terrace with amazing views of the Mediterranean Sea. Located on Benidorm's frontline of Poniente Beach, the 'peaceful playa', besides the Dove Park and only 50 metres from the Old Town. Ideal for those looking for sun, sand and sea, these apartments overlook the Mediterranean and the popular Poniente Beach in the lively, Costa Blanca resort of Benidorm.